For being so small, Santa Catalina sure has a lot to offer in the cuisine department. With over 20 places to dine at, you're sure to find something that everyone in your group will enjoy and you most definitely won't get bored with the food options! We've listed a handful of our favorites below. Inexpensive, tasty local hang spot. Coldest beer in town. Ask Roberto for his homemade ceviche! Location very close to the Fluid shop and town beach. One of our fave go to's! Panamanian and international cuisine. Ask for the tuna! Pablo and Shenida treat you right! These folks work hard to provide the tastiest Tapas in Catalina. Juan and Chrissie fusion entrees are top notch! They always have a great selection of wine, too! Alyn & Amparo have created a great vibe in this garden restau/bar. The pastas are tasty but the seafood's our favourite. Nice spot to hang & catch some evening vibes. Some of the best seafood in town!! Chano serves up tasty plates of yummy art! Our go-to breakfast spot! Nutritious and delicious breakfast and lunch. Smoothies and vegan and vegetarian options. Across from the school in town. Located at the town beach across from Fluid. 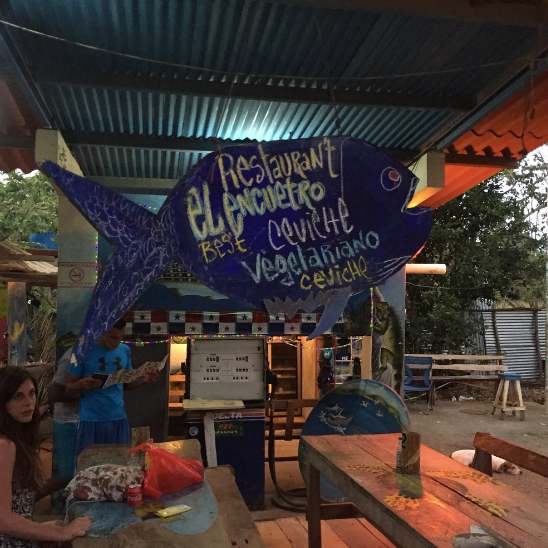 This Italian/Panamanian fave offers seafood, pasta and some of the best sunsets in Veraguas..possibly the world! This restaurant is nestled a little out of town and up the hill. Luis and his family treat everyone like family and food is almost as good as the amazing view! Villa Coco's restaurant is full of ambience and tasty options. Nestled on their hotel property you can always get a snack or beverage and chill by the pool! Let Devi and Natalia treat you to some deeelicious ceviche!! So, so good! Dinner only, located in town. Best burgers in town! Yummy sangria. BBQ'd meats and fish. Surf board graveyard. Located by Sherelley's close to the point. Long time social hub for the best fire baked pizzas around! Good music, cold beer, and great vibe all around! Overlooking Playa Estero this restaurant has it all..with an amazing view. Serving breakfast, lunch and dinner these folks make sure you come away satisfied. This place provides us with fresh bread for our tours and serves up breakfast, lunch and dinner. Looking for an espresso? Yea..us to..and you can find them here!! Stop by here for a delicious sweet treat and some coffee. Carolina bakes some of the best sweets in town!